The most lucrative sponsorship deal in NHL history has been put in doubt after an Ontario judge ruled in favour of Labatt's claim that the League reneged on its deal with the beer company. 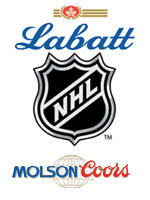 The Ontario Superior Court ruled Friday in favour of Labatt's accusation that it already had an agreement in place with the NHL before the League committed to a $375-million sponsorship deal with arch-rivals Molson Coors. It was called "a monster deal" by NHL chief operating officer John Collins when it was unveiled in February. “We are pleased that Budweiser’s sponsorship of the NHL will continue,” Charlie Angelakos, Labatt's vice-president of corporate affairs, said in a release on Friday. Labatt dropped the gloves with its beer rival in February when it filed a notice of application to the Ontario Superior Court asking the court to toss out the NHL's new agreement with Coors. Budweiser is owned by Anheuser-Busch, which is Labatt's corporate parent. Anheuser-Busch is also the sponsor for 22 of the 24 NHL teams based in the United States. The news comes during hectic period for the NHL. Besides being in the midst of the Stanley Cup final between Vancouver and Boston, the league is dealing with the relocation of the Atlanta Thrashers to Winnipeg, as well as Colin Campbell stepping down as the NHL's head disciplinarian.